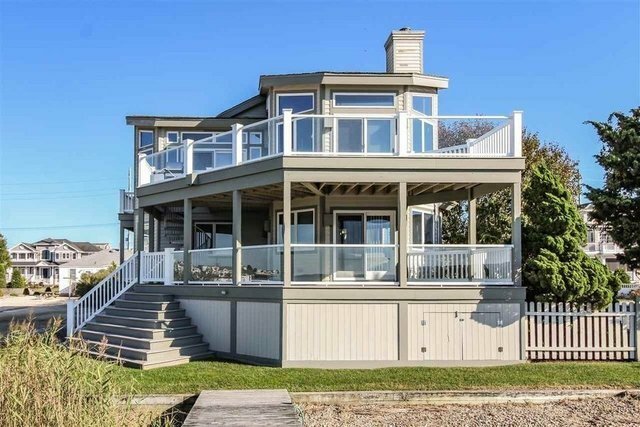 Welcome home to the bay at 315 58th Street, Avalon with spectacular 180 degree views. Situated on an oversized 60x170 lot, this beautiful bay front home is overflowing with spectacular views from every window. This upside down style home features an open floor plan and offers five bedrooms, four full bathrooms, attached one car garage, floating dock and two boat slips. As you enter the home into the grand foyer you are greeted by a cascading wood staircase leading up the second floor. The main living area features built in cabinetry with fireplace, spacious dining area and kitchen with breakfast bar. The second floor sun deck with glass panels allows for unobstructed views of the bay and wetlands. Also on the second floor is the master bedroom suite and bath with unique marble tile. In addition the second floor has a second bedroom and full hall bath. Downstairs there is a first floor family/recreation room which comes equipped with a wet bar and has access to a shared covered deck. There are three additional bedrooms on the first floor, and two full baths, one of which is en-suite. Outside there is an enclosed shower and stone driveway with parking for 4+ cars. This home is being sold in œAS IS œ condition. The possibilities are endless. Enjoy the current house or design and build your new three story home. 315 58th street is the perfect bay front location thats also just a short two block walk to the Avalon beaches and a quick bike ride to the center of Avalon and Stone Harbor.